Reclaimed rubber is generated during the retreading of tyres and from milling scrap tyres. Particle sizes from 1cm to 0.5mm are available. Reclaimed rubber granules have traditionally be used as fillers or have been reconstitued using conventional rubber processing. Rebonding rubber granules with Polyurethane binders is a less capital intensive process that uses less energy than conventional rubber processing. The properties of the rebonded rubber depend on the type of rubber and distribution of particle size, the constitution and amount of PU binder used, as well as the degree of compaction of the rubber/PU mixture. A major use of PU bonded reclaimed rubber is in the floors of gyms & sports halls and in outdoor athletic tracks and sports surfaces such as tennis courts. There is also a large market providing safe surfaces in childrens playground areas. 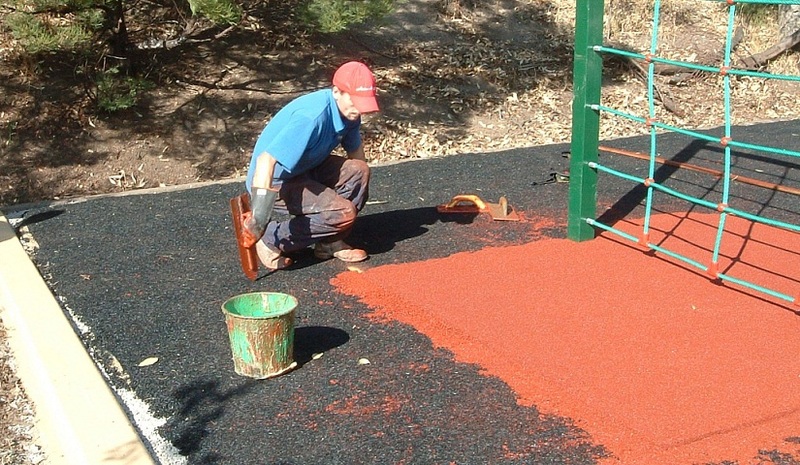 Sports surfaces may be laid direct on to an asphalt surface, using graded rubber granules coated with an isocyanate-terminated moisture-curing prepolymer. The porous, bonded rubber granule layer is usually coated with a pigmented flexible PU elastomeric coating depending on the degree of wear resistance required.